Nestled in the scenic Turtle Mountains along the U.S./Canadian border, Lake Metigoshe is one of the most popular year-round vacation spots in North Dakota. The small lakes within the park provide excellent opportunities for fishing, canoeing, boating, and swimming. Visitors can enjoy over 8 miles of trails open to hikers and mountain bikes. During the winter, visitors can spend their day cross-country skiing, snowshoeing, sledding and ice fishing. 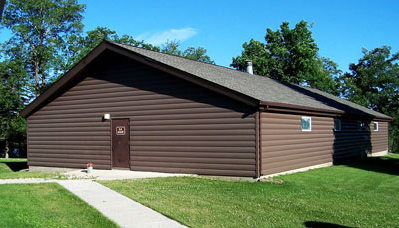 The park is home to the Lake Metigoshe Outdoor Learning Center, which offers programming on history, nature, and recreation. With a multitude of year-round facilities, Lake Metigoshe is an ideal location for special events. Situated along the United States and Canadian border this cabin makes a great getaway for larger groups. Slemmen sleeps eight with a bedroom and three futons in the living area and includes a gas fireplace, full kitchen and bathroom. 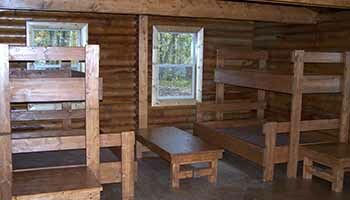 This secluded cabin is located in the Northern part of the park. Stepping off the front porch, you will find a number of trails maintained year round. On the weekends (Friday & Saturday) and holidays, a two-night minimum stay is required for the Slemmen Cabin. White Pelican cabin is located along Hemerick Trail in the wooded Turtle Mountains. The White Pelican comfortably sleeps six with two bedrooms and futon in the living area and includes a full kitchen and bathroom. Enjoy the deck and private grass area in the summer or cuddle up with a good book in the winter by the gas fireplace. On the weekends (Friday & Saturday) and holidays, a two-night minimum stay is required for the White Pelican Cabin. 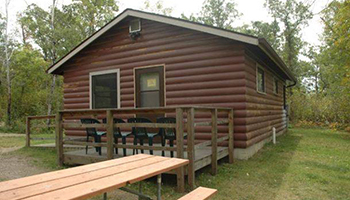 The Loon Lodge is located just north of the Kings Highway trail system located in the Turtle Mountains. This cozy cabin sleeps four with two bedrooms, one with a bunk bed and another with a queen bed. 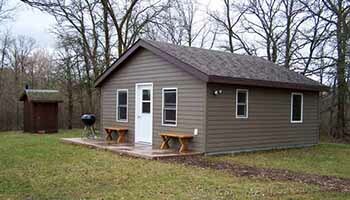 This cabin comes with a gas fireplace and full kitchen and bathroom. 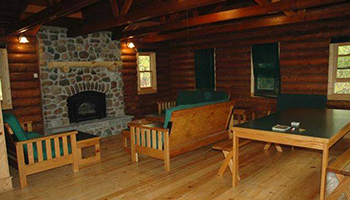 On the weekends (Friday & Saturday) and holidays, a two-night minimum stay is required for the Loon Lodge. Located in the wooded Turtle Mountains, the Cormorant Cabin offers stunning views of School Section Lake. This quiet cabin sleeps four. It has one bedroom with a queen size bed and a futon in the living room area that folds out into a full size bed. A vault toilet is located on site and shower facilities are located in the main campground during the summer season. The Osprey Cabin is perfect for the adventurous type. This backcountry cabin is located along the east shore of Lake Eramosh. The cabin is only accessible by a 2-mile hike or a 1.5-mile canoe ride and short portage. This cozy cabin sleeps four with two full beds and two twins set up bunk bed style. The cabin includes wood, a wood burning stove and a lantern with propane cylinders. A vault toilet is available onsite but water has to be packed in. 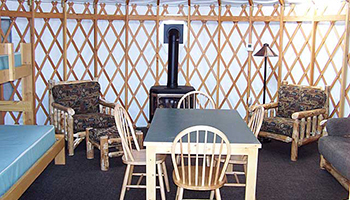 - Smoking is not allowed in any cabins or yurts. included in rental fee. 10 canoes are available for rent. Cross-country ski rentals are available for $15/day. The park has 34 pairs of cross-country skis available for rent. included in rental fee. Two single and four double kayaks are available for rent. Snowshoe rentals are available for $15/day. 35 pairs of snowshoes are available for rent. 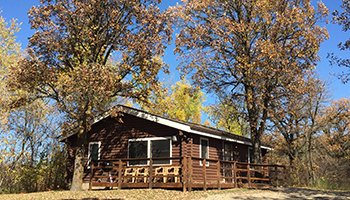 Nestled in the scenic Turtle Mountains, on the shores of Lake Metigoshe, Lake Metigoshe State Park was constructed by the Works Progress Administration (WPA) in the 1930s and is one of the most popular year-round vacation spots in North Dakota. This is North Dakota's first National Recreation Trail. Built by the Youth Conservation Corps (YCC) in 1974, it was dedicated by Governor Arthur Link in 1976. This self-guided interpretive trail is approximately three miles in length and takes about two hours to hike. Interpretive brochures are available at the trailhead or at the park office. These trails are open to hiking, mountain biking, cross-country skiing and snowshoeing. Keep an eye out for a variety of wildlife and vegetation. You might see Moose, White Tail Deer, a Pine Martin or Ruffed Grouse. Our trails run through forested, grass and wetland areas creating many unique viewing opportunities. 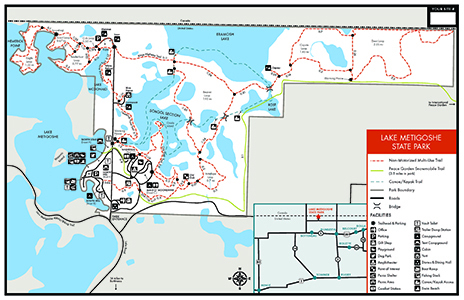 A portion of the Peace Garden Snowmobile Trail is found within Lake Metigoshe State Park. This 3.7-mile section runs from the west side of the park, coming in from Lake Metigoshe, to the northeast park boundary and continues on to the International Peace Garden. Snowmobiles are to be registered and licensed according to ND state law and are only allowed on the snowmobile trail and designated roads within the park. The Canoe Trail starts 200 yards east of the Warming House Trailhead at the School Section Lake dock. The Canoe Trail route is provided only to give users a general route to enjoy a variety of wetlands and portages. Canoe/kayakers are allowed to travel anywhere on the lakes and wetlands. When canoeing or kayaking, please stay away from nesting birds and do not attempt to climb on beaver dams or lodges. Please watch for hidden obstacles that may be just under the water's surface. Canoe and Kayak rentals are available (inquire at the park office or the entrance station). Bring your costumes, decorations, and candy to join us for a great weekend at the lake. There's will be a variety of spooky events that are fun for the whole family taking place to include a spooky movie and trick-or-treating in the modern campground.